This year I’ve decided I’m going to write the hell out of some Node code. That’s both good and bad. It means I’ll be learning more and more about Node as a side effect, but on the flip side, I’ll probably be producing a bunch of silly, not-terribly-practical examples as I go along. As always, I encourage people to remember that I am not an expert at this. I’m learning. So, please feel free to comment about what you would do differently. On the flip side–if I actually make something kinda cool, then let’s just pretend I’m brilliant, ok? 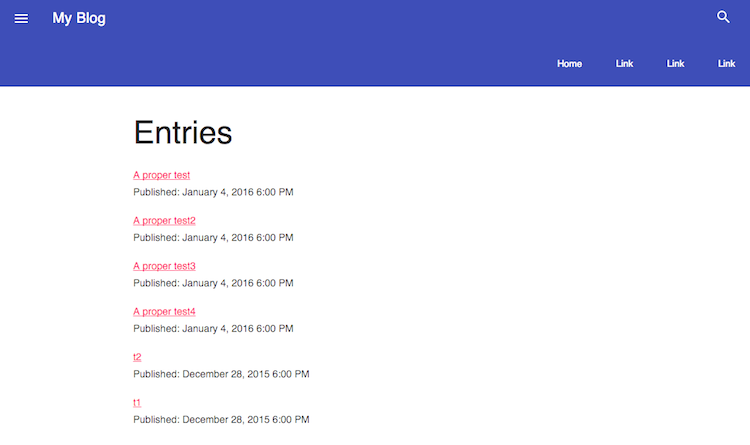 During the holiday break, I decided to work on a new demo application using StrongLoop. 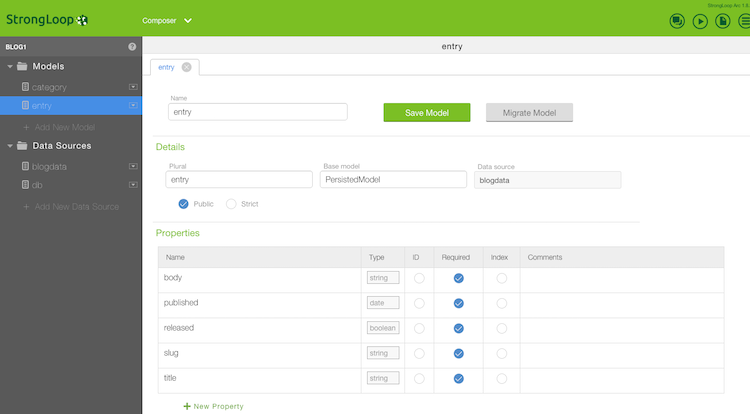 I’ve blogged about StrongLoop before, specifically about using it to help build APIs powered by Node. There’s a lot more to StrongLoop and I hope to share that with you as the year goes on. But for now, I want to focus on the Loopback-powered aspects of StrongLoop, specifically using the ORM-like APIs to work with data. With that in mind, I decided I’d begin by building a blog. To be absolutely clear, I’m not advocating that you go out and build a blog with StrongLoop. Just use WordPress. (Yes, even with my complaints about it, I’d just use it.) Or, a static site generator. But when I’m practicing a new language, I like to build things where I can focus on the language and architecture instead of figuring out features. We all know what a blog is. That makes it easier to get started. For the first version, I figured I’d support a home page that lists blog entries and a detail view of the blog post. That’s it. I’m going to save both administration and security for the next update. I then went back to Entry to set up the relationship. This is where I hit my first issue. While you can define a property of another type, it is a singular property. So, I could add a category field to entry but I’d only be able to assign one category to an entry. 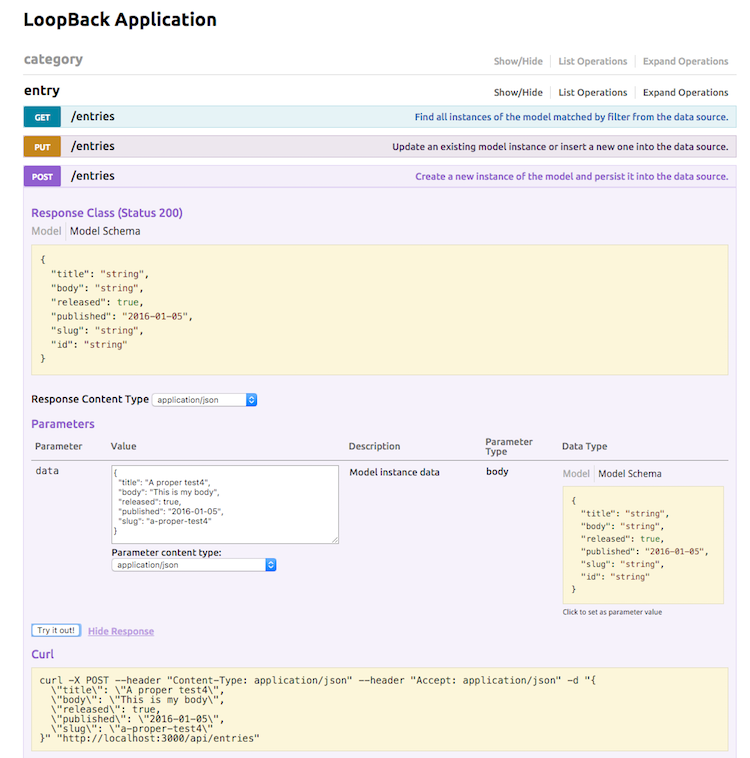 Of course, Loopback supports all kinds of “multi” relations, but unfortunately, the web based admin doesn’t support setting it. Nor will it report it either. In the first screen shot, I’ve already got things working fine, but there’s no indication of it. I have no idea how it figured out that the plural should be categories. You can define a plural name for your models but I never did for category. If it figured it out automagically, then cool. I don’t have a proper “admin” yet, but it takes mere seconds to use the explorer. That’s damn convenient. Ok, so just to recap—at this point I’ve used Loopback/StrongLoop to define my content models. I even made a bit of content. I then turned my attention to actually building the application. I’m a bit unsure about why I need to check for ctx and ctx.instance, but without that check the server crashed when I added new data. And of course, as I see the code above, it makes much more sense to do this when the data is persisted, not loaded. As I said, I’m learning. I’ll fix this before the next blog post. //first - did we get any? You can see where I define an upper and lower range for the published property. And, that’s really it. Here are a few additional notes not necessarily related to the core point of this entry. For design, I tried Material Design Lite, which ended up being much more complex than Bootstrap. Maybe it’s just that I’m so used to Bootstrap, but I found working with MDL to be a bit overwhelming. Not so much on a component scale (which I didn’t actually get around to using), but as a layout template it was confusing as heck. I got it working, but honestly, it felt like a lot of work. One of the coolest things about Loopback is that it uses a memory storage system out of the box. That means you don’t have to set anything up while setting stuff up. Unfortunately, as soon as I got into the server-side code (I mean outside of the Model stuff) and my server was reloading with every edit, that stopped working for me. If you want to see, and criticize, the code as it stands now, check it out here: https://github.com/cfjedimaster/StrongLoopDemos/tree/master/blog1. Ok, so what do you think? In the next entry, I’m going to lock down and secure those remote methods. Then I can start working on an admin.